The Nuclear Science Division together with CPEP (the Contemporary Physics Education Project) have produced the Nuclear Science Wall Chart. These charts are available in three sizes. Complete ordering information can be found from CPEP. On this site we have a Teacher's Guide in PDF or HTML format that provides background information on the chart and the nucleus. Contact CPEP for permission to use the chart or any section of it. 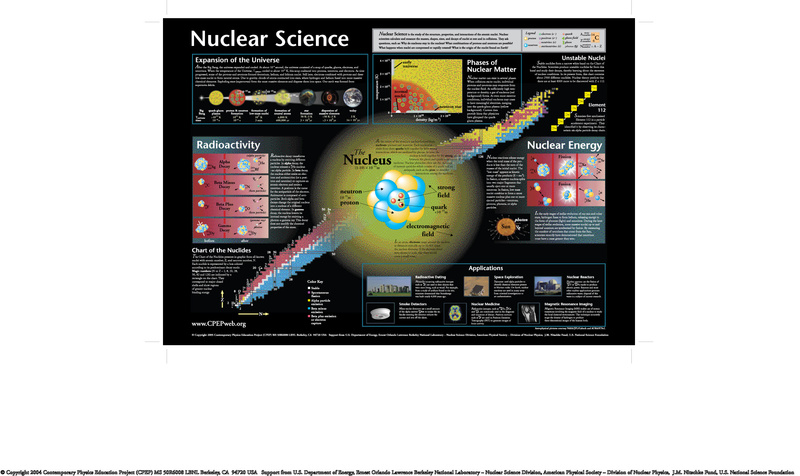 Large Nuclear Science chart 59.5" x 41.5"
Poster Size 29.5" x 21"
Package of 30 Notebook charts 16" x 11"
Please visit the ABC's of Nuclear Science to learn more about the nucleus.